Learn all about the weather, with the Cat In the Hat! 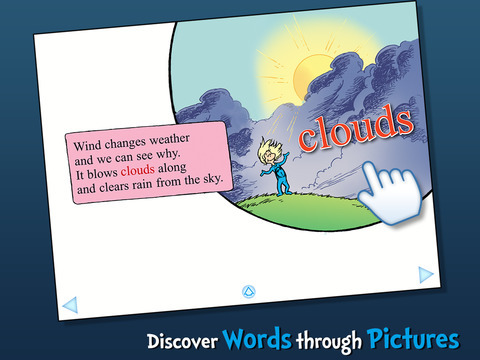 Young readers will love learning with Oh Say Can You Say What's the Weather Today? (Dr. Seuss/Cat in the Hat). This non-fiction title, published first in print in 2004, was created to give children ages 5-8 the chance to explore the exciting world of weather and the study of it, meteorology. The learning library series was created in the late 1990's by Random House with a talented team of illustrators, writers & educators, who mimic Seuss's rhyming verse and quirky illustrations beautifully. Overall, this series is as fun as it is educational, pairing animated and interactive 'pop-up' style elements with high-quality science content. Some of the interactivity is just for fun, rather than story-related, but all of it keeps kids engaged. When sharing these titles in my child's classroom, the Cat-in-the-Hat Learning Library apps have been the most often re-requested. Children will be drawn in by their familiarity with the characters and then entranced by the extraordinary natural world. This book app is a great introduction for young scientists to the extraordinary world of our planet's weather and the scientific study known as meteorology. Join the Cat in that Hat as he travels by hot air balloon up into various weather phenomena including rain, snow, thunder, tornadoes, and (yikes!) even hurricanes! Explore pictures, learn new vocabulary, and personalize the story with your own narration. Learn all about thermometers, anemometers, wind vanes, cloud formations, humidity, fog, smog, weather folklore, how to stay safe in lightning, and much more with the Cat in the Hat!